So, I've just been telling you about the incredible discovery made by Mariette (1846-1930) on November 1, 1850 of the entrance to the Serapeum, this mysterious place at Saqqara on the Giza Plateau, with its complex network of underground tunnels containing a number of sarcophagi. There are 24 enormous ones, measuring 4m long, 2.30m wide, 3m30 high and each weighing over 80 tons, made of granite, and found empty. These sarcophagi raise many questions, as their existence represents a technological feat that cannot be explained in today's terms. I have also talked about the religious rituals that were carried out around this place devoted to the Apis bull, which according to the ancient Egyptians represented the form in which the manifestation of the god Ptah/Osiris chose to incarnate, and which symbolised resurrection, the link with heaven, a pathway to eternity. Before returning to the challenge of the sarcophagi, I will focus on an essential topic that usually fails to be addressed in discussions about the Serapeum: Imhotep/Asclepius. Remember the statue of Bes that Auguste Mariette found at the beginning of his exploration of the entrance to the Serapeum? Note that this being, revered for its oracles at Abydos, was also known to be a magician of dreams - that's to say he inspired dreams that could then be interpreted. 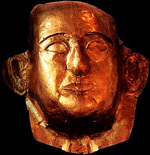 Egyptians often placed a statue of Bes in their bedroom. At the time dreams were seen as an important means of therapy, a fact that is essential for understanding the meaning of the Serapeum. In ancient times dreams were associated with healing and medicine. Remember that we are near the Saqqara pyramid of Pharaoh Djoser, built by the legendary Imhotep some time before 2660 AD. Imhotep, whose name means " the one who comes in peace", was not only chief minister of Djoser, the architect of the kingdom (the first in Egypt according to many scholars), high priest of Heliopolis and grand magus, chief of all the priests in Northern Egypt, but also a great doctor (probably the first also) with his school of medicine and his temple next to the Serapeum. More than 2200 years before the birth of Hippocrates in Greece, still known as the father of our medicine, Imhotep in Egypt knew how to diagnose and treat over 200 diseases, using terms of anatomical divisions and practising surgery. But first, who was this Asclepius? Nothing less than the son of Apollo, the ancient texts tell us, and of the nymph Arsinoë-Koronis. (Note in passing, the city of Fayoum in the confines of the Giza Plateau is called Arsinoë.) Yet another demigod? In any case we are told that his cult, which had already existed on the island of Kos for a very long time, was introduced to Rome in 290 BC during an outbreak of plague. His temple was erected on an island in the Tiber and later it was confused with Serapis. You read correctly, Serapis. So maybe the cult of Serapis is a later disguised version of a cult to Imhotep-Asclepius! But what else is said about Asclepius? That he was raised by the centaur Chiron (the last centaur on Earth according to the ancient Greeks - now that's an "animal" that would fit quite well into our large sarcophagi) in an underground cave, and was taught by him everything about medicine and more besides - because Asclepius was not content just to heal but he also raised the dead. The god Zeus in his heaven, disturbed by Asclepius's enthusiasm for immortalising earthlings and thus upsetting the natural order of things, finally struck him with a thunderbolt. Does this not remind you of how the cow receives a flash of lightning before conceiving the Apis bull? (See previous article, part 1.) The fact is that Ptah is often connected with Zeus and with lightning. Asclepius appeared in dreams to the priests and revealed to them the remedies for their patients, or else the patients received them in a dream and were cured. He was shown with a rod with a snake coiled round it, the symbol of medicine (not to be confused with the caduceus of Mercury, with two snakes symbolising commerce and communication). Asclepius had three boys and six girls including Hygiene, Panacea and Meditina. Meditina is of particular interest to us here, as you'll see a little further on, for she was said to be a "snake bearer". When Zeus struck Asclepius he was transformed into the constellation Ophiucus ("snake bearer"), also called Serpentarius - strange, isn't it? Ancient Egyptians taught that the gods when they died were transformed into a constellation or a star. And as you'll see, the snake plays a major role in the Serapeum. It is important to emphasize that our Hippocrates (the father of medicine, from whom we derive the oath our doctors take) is recognized as a descendant of Asclepius on his paternal side. Even if it is to him we owe the words chronic, endemic, epidemic, convalescence, paroxysm, etc, and though Western medicine claims him as parent, in reality his concept of medicine was very different from ours. Dr. Houdant for example says that "the Hippocratic treatment is much more of a meditation on death." 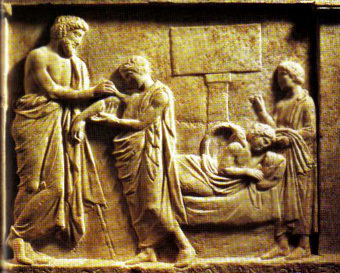 In fact, Hippocratic medicine was a carbon copy of that of Asclepius and was practised in many places, in temples that had certain features in common. They had to have a temple-sanatorium at ground level and subterranean caves with an underground spring. That is what we also have with the Serapeum of Saqqara. In Athens you can still see the sanctuary of Asclepius today on the southern flank of the Acropolis, beneath the Parthenon, with its grotto and its spring. This grotto has since been taken over by the Orthodox Church. It is important for me to explain how Asclepius and his descendent Hippocrates treated their patients because they probably worked in the same way as Imhotep in the vicinity of the Serapeum. Besides their treatments with plant compounds and apart from dealing with fractures and surgery, this is what constituted the heart of their medicine: they made their patients drink the water from the underground springs and bathe in it, because for them it was obvious that the water carried in it the healing powers of the spirits of the Earth. After that they only dealt with those who had the courage and determination to undergo the treatment. Patients had to fast and make repeated ablutions in the sacred precincts of what was called the Abaton, that is to say in the temple, the caves and the underground passages, which no one else was allowed to enter. Then the patients were made to sleep in the group dormitories of the Abaton so that they would dream. There were specific rituals for encouraging dreaming, where the deepest wisdom of Mother Earth was supposed to send you dreams revealing the reasons for your illness and how to treat it. The next day you told your dream to the priests who would then prescribe a treatment. It was also said that the first image that came into the dreamer's mind would become a guardian spirit and would never leave them. The lesson to be drawn from this study of dreams was very sophisticated. They did not give a generalised interpretation of the dreams, they considered that a dream symbol gave rise to a different meaning depending on the person. Each person was considered to have their own dream language and detailed work was done on the images and emotions of the patient. But Asclepius did not work only with the priests of his cult, he was assisted by - guess what? - a horde of snakes. 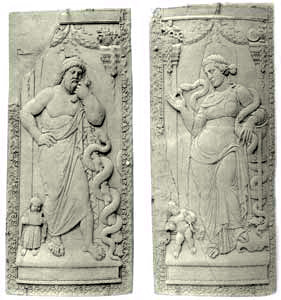 Non-venomous snakes slithered all over the floor of the dormitories during the night and were believed to be divinities who mediated between Asclepius and the patient. Because of the way they shed their skins, snakes were a symbol of rebirth and resurrection. (Incidentally, I can tell you that the word "life" in Chaldean is the same as for "snake", and in Arabic it's the same except for one letter.) Among the ancient Egyptians, the uraeus - the divine cobra on the headdress or forehead of the pharaoh - represented the life force with all its power, as it was supposed to strike with lightning any enemy or any negative principle. However they did not confuse this snake of highly positive qualities with the other, the serpent Apophis who brought chaos and negativity. As a rule, the snake had the reputation of being "invigorating" and bringing eternal youth and immortality. Why? 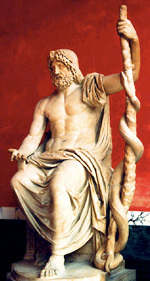 Apart from shedding its skin, it was because Asclepius had a reputation for knowing how to administer doses of poison and antidote, including snake venom, with such skill that he was able to bring the dead back to life. He was known in antiquity to be a master of resurrection thanks to his snakes. We now understand better why when he was transformed into a constellation it was that of Ophiuchus, the serpent bearer. We can also understand better why the symbol of medicine is the rod with the large snake. In the small Imhotep museum that has just opened next to the Serapeum and displays objects and statues from in and around the Serapeum, what do we find? Snakes in all forms. The feet of a statue of Imhotep posed on beautiful painted snakes, carved cobras that covered the enclosure walls around the pyramid of Djoser, friezes of snakes in bas-relief found above the Serapeum, and so on - snakes everywhere. And what was Imhotep's genealogy? 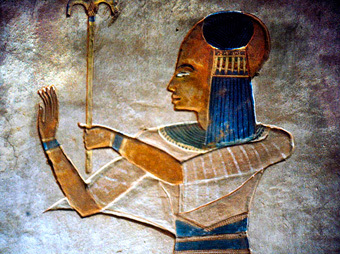 His mother Kheredu-ankh was a mortal raised to the rank of semi-divine (like the mother of Asclepius) as she claimed that her father was the god Banebdjedet, a ram god of fertility that the Greeks later named Pan. This very strange ram curiously had four heads, two facing backwards, two facing forward. It was said that within it was incorporated the essence of the world in four forms representing the four spirits souls (ba) of the four masters of the world Ra-Shu-Geb-Osiris (perhaps at a time when these four deities were embodied together in a ram?) In any case in Edfu, Banebdjedet was celebrated as one of the Great Ancestors. 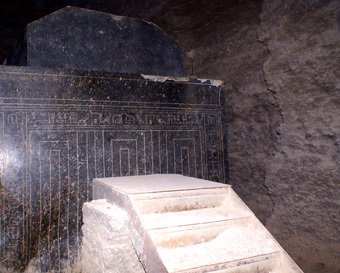 And at Mendes (Tell el Rub'a) there were found sarcophagi (of normal size) containing mummified sacred rams. His wife was the fish goddess Het-Merit. In ancient Egypt fish represent the transformation of the gods - don't you find that all this fits the same theme of metamorphoses and transformations, of gods producing different frequencies and manifestations? In short, there's a lot of similarity with Asclepius. Let's not forget that the ancient Greeks already disagreed about Asclepius, saying he was much older than the official dating was willing to say (even then). Linguists argue that the true meaning of the name Asklepios etymologically is "the hero of the mound". Now all the sacred history of Egypt is based on a primitive mound raised above the waters. Finally, might not Aesculapius and Imhotep be the same person? Do they not seem alike because of their semi-divine origins, their concept of medicine and the almost miraculous power that they had over health, transformation and even resurrection? In both cases there is the use of a temple sanatorium (at Saqqara archaeologists know there was one next to the Serapeum like that of Alexandria), and of an underground network, all related to snakes. 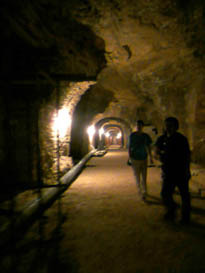 According to the Egyptian historian Ahmed Osman, the Serapeum was maintained and served by sort of volunteer monks, who watched over the patients in the complex. "The followers of the cult of Serapis were supposed to be granted the right to eternal life without the need of mummification if they showed devotion to the deity and went through an initiation ritual that included baptism with water." Is it not this same immortality that one is supposed to gain in Catholicism through baptism? It is time to say something about one of the greatest magicians of all Egypt. More than a thousand years after his death, he was still considered a hero by the Greeks and the Egyptians. 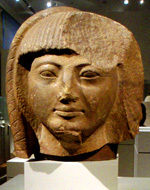 He is the Prince Khaemweset (1290-1224 BC), son of the pharaoh Ramses II. Why was this prince so dedicated to the Serapeum during his life? To the extent that when Mariette had to use explosives to get through a large rock blocking the first gallery of the Serapeum, and in the rubble found a mummy with a golden mask with human features, he deduced that it could only be Prince Khaemwaset. Certainly his seal was everywhere on the objects and jewellery found with the mummy. However a significant doubt remained. First, Mariette could have been influenced at the time by late stories attributing to the prince a desire to be buried with the bulls. Then certain things just didn't hold together. Some Egyptologists think this mummy could very well be that of an unknown man buried in a crypt above the vault. Apparently the wall of the crypt collapsed under the impact of the blast. For others, much better informed in my opinion, this mummy, even though it had an anthropomorphic shape and gold funerary mask with human features, in fact contained the remains of a bull that had been given human shape, with jewellery and amulets bearing the name of Khaemwaset. Why is there still a doubt? Well, simply because the mummy has vanished. Yes. As usual, the really significant objects cannot be found. 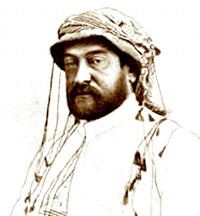 It is even more unfortunate because Mariette's detailed reports on the Serapeum have also disappeared, strangely enough … The fact is that Prince Khaemwaset did not only contribute to the enlargement of the underground labyrinth and oversee seven Apis burials in the Serapeum, but he showed a genuine devotion to this place. Why? Why did the fourth son of the pharaoh Ramses II undertake throughout his life to restore the teachings of the Great Ancestors, those who had arrived first in the land of Egypt? The prince was working to re-establish those aspects of the Tradition that were the most sophisticated, the most secret and the most magical. Why did he, as we are told, at the end of his life live almost all the time in the underground Serapeum? First of all, who was he? After a period of military honours - he was known to have been present at the famous Battle of Kadesh - he became a priest and then governor of Memphis and Grand Sem Priest of Ptah worship in Memphis. He was president of all the craftsmen. He is often called the first Egyptologist in history because he carried out an unprecedented campaign to restore the ancient monuments of his country, such as the pyramid of Unas and a dozen pyramids and important monuments of previous dynasties. His passion for his country's past made him inscribe on a statue, "I love so much antiquity and the nobility of the earliest times." Very learned, he also had a huge library of documents on sacred and magical subjects that aroused envy in the ancient world. He founded the library of the Ramesseum in Western Thebes which contained only papyri about magic. He is said to be, among other things, the author of the "Papyrus that produces terror and respect" mentioned in the time of Ramses III. This attitude of collecting, of gathering evidence and knowledge of the past, of respect and maintenance of the Tradition, in itself marks Khaemwaset as a constant researcher of the hidden principle of divine intelligence and the human capacity to rediscover it. His approach corresponds to the spirit of the god Thoth-Tehuti, of whom (I haven't yet told you this) many experts now dare to think that Imhotep could be the direct descendant, if he is not the same person. Much later, the Greeks claimed that Khaemwaset possessed the famous Emerald Tablet of Thoth-Tehuti-Hermes and they always called him the "King of Magicians". Remember that in the 3rd century Clement of Alexandria considered Egypt to be the "Mother of all Mages". Khaemwaset was known for working against the Nubian magicians to prevent any foreign takeover of Egypt. He was a great magical protector of the existence of the country and of Pharaoh. In short, the prince was passionate about the most secret mysteries. What do we learn from this? That one of the projects which he held closest to his heart was to restore in his lifetime the practice of the Sed festival. This was a great ritual festival which originally was to be celebrated every thirty years of the pharaoh's reign so as to renew his accession. It was the celebration of the Jubilee. In fact the Prince reintroduced the Sed festival in favour of his father Ramses II, who celebrated it 14 times during his reign. Why? Well, because to initiates, Sed was in truth a great ritual of rejuvenation. No need to wonder at the incredibly long life in full fitness of his father Ramses II, the pharaoh who lived the longest. In the original form of the Sed festival, the pharaoh had to run naked in the full sun and without food or drink, until sundown some say, around places that symbolised the different provinces of southern and northern Egypt. If he did not die of exhaustion that meant that he was reinstated in office by the approval of the gods. After that came all sorts of secret rites enacted out of sight in the holy of holies of the temple, including invigorating rituals of rejuvenation. It is mentioned sometimes that the pharaoh had to spend a whole night wrapped in a bull's hide. If he could not stand the physical effort of running, if he was taken ill, it was said that it was time for him to join his ka, that's to say, to move on to the next world. As you see, being pharaoh was no easy job because they carried the responsibility for the cohesive force of the world on their shoulders - at least the earliest pharaohs did - and they absolutely had to be equal to the task. They were the bearers of the positive force, of the harmony of life, and had to keep the upper hand at all times over the forces of chaos that threatened the positive development of events, of things and of people in the country. So Prince Khaemwaset, a great expert on the Sed rituals, with uncommon powers and knowledge, passionate about medicine, rejuvenation and resurrection, spent most of his time in the corridors of Serapeum following the example of Imhotep or of Asclepius. Why? Surely for something closely connected to his passionate research, don't you think? In 1991 a Japanese team from Waseda University discovered north of the Serapeum a building containing 2,500 items bearing the seal of Khaemwaset. What was kept inside them? Was there any liquid? Were the sarcophagi used in the metamorphoses of the gods, in their possible changes of frequency, in medical treatments with snakes, in a rejuvenation process? Were they the receptacles for giants or were they used for the resurrection of the dead? We are told that they date from the 18th dynasty. Guess what, this dating is based solely on bits of 18th dynasty pottery found nearby. Who are they kidding? 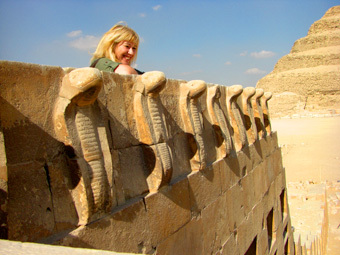 By that time the art of stone carving was in rapid decline in Egypt. And there we have these containers of 80 tons that are found nowhere else in Egypt or in the world. Imagine the technological precision used to drill to perfection these enormous thick troughs of granite in one piece, with corners that are perfect inside and out, exactly parallel. It's just incredible, unequalled to this day, and represents an achievement way beyond the ordinary. In the words of the engineer Christopher Dunn, who went in 1995 to take measurements with properly calibrated instruments, "Nobody makes such things without having a very good reason for their design," and "the tools used to create (these objects) are so precise that they are incapable of producing anything other than perfect accuracy." We are far from the worker with a hammer trying to gouge out a lump of stone. The surfaces of these huge containers are perfectly smooth with precise and perfect edges, made from a solid block of granite of an unbelievable thickness. For many experts this perfection is the proof that a very advanced civilization lived in Egypt a very long time ago. These containers are completely smooth and devoid of any inscription, except for two partially. But when you look at one of the two inscribed ones, you see a wobbly and very inaccurate line and poorly drawn hieroglyphs, in the design that was very common in the late period of false doors, a very clumsy effort. Now genuine inscriptions on sarcophagi are always perfectly accurate; the royal scribes and sculptors had a total mastery of writing and of their materials, even in bas-reliefs. Writing that was flawed would not have been allowed or tolerated on such objects. So at what point were these writings added - perhaps quite recently? Has someone tried to make us believe, misguidedly and without success, that these objects are not so old after all? And why try to disguise the glaring truth, namely that these objects were designed to be mysteriously smooth and without any inscription? Why would anyone want to turn them into ordinary items, when their dimensions speak for themselves?